Welcome to Winner Racing's store. All aluminum radiator and silicone hose kit, oil cooler, intercooler and kit for racing auto and sports auto bike. We promise that all our products are made of the best materials and advanced manufacture technique. All our products are 100% fully tested to ensure top quality. All manufactured in a brand new state of the art facility with the same manufacturing process that OEM companies use. 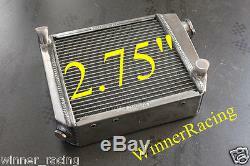 Brand New racing aluminum radiator for Mini Cooper S, Morris Moke, Countryman, Saloon pre1997. This radiator is heavy duty designed, come with 70mm thick core, great for V8 conversion. NEVER WORRY ABOUT OVERHEATING PROBLEM. The core of the radiator is welded in vacuum brazing furnace, no epoxy. The tanks are 100% welded by TIG. The material of the radiators is the same as aircraft. We never copy from another companys catalog or website. Low Price Guarantee - We Price Match!!! Mini Cooper S, Morris Moke, Countryman, Saloon pre 1997. Papal (please verify your papal account). All shop order, bulk order, wholesale is welcome. Please feel free to ask. 2 weeks to one month. You can return your item within 7 days if the item you receive is not as described. We will arrange for a replacement to be sent as soon as the item is received by us. Welcome to my store again. The item "70mm alloy radiator Mini Cooper S, Morris Moke, race/rally 1959-1996 1995 1994" is in sale since Tuesday, October 30, 2012. This item is in the category "Vehicle Parts & Accessories\Car & Truck Parts\Cooling Systems\Radiators". The seller is "winner_racing" and is located in Linyi, Shandong. This item can be shipped worldwide.